Discussion Would your Mama be happy if you were enlightened? Would your Mama be happy if you were enlightened? Knowing that their child has removed suffering for eternity by removing their sense of self and will never be reborn? You expect anyone to say 'no'....? What kind of a weird question is that....? I don't know, i suspect my mother is rather looking forward to us meeting up again in the afterlife sometime. But then she is a little odd. My mother is not Buddhist but she does like a lot of things in Buddhism such as knowing that things get ruined with time like 'don't get attached to anything glass'. Are you kidding? My mother would be chasing me around the house trying to sprinkle holy oil on me to drive the demon out. Given her age, the shock might kill her. No, I don't believe she'd like it one bit. My mama would think I was deluded, or crazy, or both - and she would probably be right! Enlightenment is the manifestation of the interconnectedness of all sentient existence. This means that if you were enlightened, your mom with all other sentient beings would also be connected to some part of that enlightenment. If you think that your enlightenment will result in happiness, then know that your mom will also partake in some part of that happiness as well. Enlightenment is awakening. It is a beginning, not an end. You out it quite well,@dooksta123, thank you. 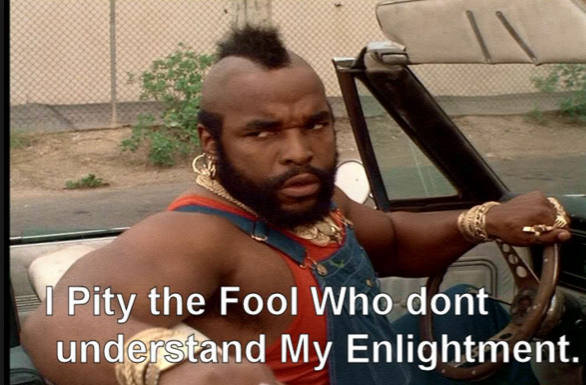 Strange to think: If someone is "enlightened," there is nothing anyone can do about it. Likewise if they're not "enlightened," there is nothing anyone can do about that either. Whether mom is happy or sad is mom's problem. "Would your Mama be happy if you were enlightened? Come to think about it, most all mothers just want their children to be happy - successful helps too. This "...removing their sense of self and will never be reborn?" does not fit well. Definitely, HOMEWORK TIME for @dooksta123. Then again, homework time for everyone. Or at least cocoa time. My Mom would have probably been happy if I developed enlightening qualities. On a personal note I think it's best to expand the sense of self to include us all before we attempt to abandon it altogether. I think my mom would be fine with it. Though I can't really picture myself sitting at dinner with my mom and trying to convince her I was enlightened. It's not like coming out of the enlightenment closet where you have to suddenly make an announcement and wait for a reaction (I don't think). I trust people who simply go about living their lives moreso than those who make a point in announcing their new labels and/or titles. This reminds me of this American chap called Dan Harris, who wrote a book called 10% Happier... It was all about whether you could pursue enlightenment and still be ambitious and career minded. I thought it was nonsensical. If you admit the goal of enlightenment, meditation and all the parts of the Noble Eightfold Path and the perfections, surely you have to let go of worldly goals and desires? It seems classic, a straightforward conflict to still have those status and money goals. My mom would probably ask me how much it paid. Then she would remind me to smile and to drive safely.